Bronagh M. Kelly is a native of Ireland who has been practicing law in the United States since 2012. With experience across multiple legal disciplines, Ms. Kelly brings a unique perspective to the practice of law. While a substantial portion of her practice is devoted to the area of family law, she also practices in all areas of commercial and civil litigation. Bronagh graduated from Queen’s University Belfast in Ireland, with a Bachelor of Laws in Common and Civil Law with Hispanic Studies. She spent her third year of university at the University of Salamanca, Spain, studying Spanish Law, Spanish language, as well as other European languages. 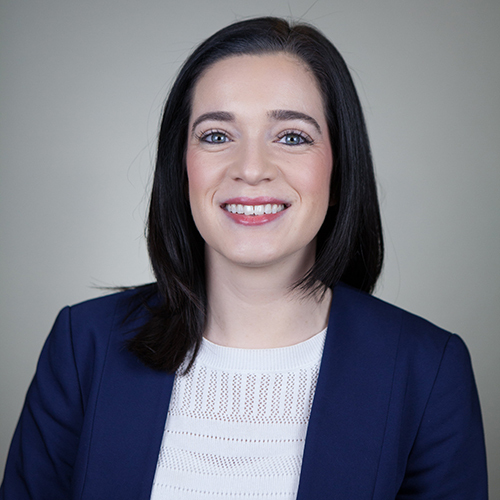 After graduation, Bronagh passed the New York Bar Exam in 2011 and began practicing law at a nationally renowned firm focusing on commercial defense litigation in New York City. She gained extensive litigation experience and handled complex commercial liability cases from inception through resolution, which included motion practice, court appearances, and client contact. Bronagh’s clients included an international furniture manufacturer, two of the world’s largest hotel chains, international clothing retailers, an international not for profit conservation society, car rental companies, and some of the nation’s largest insurance companies. Many of the cases were valued in excess of $10 million. After marrying a fifth generation Nevadan in 2016, Bronagh relocated to Reno and joined Woodburn and Wedge. The transition from commercial defense litigation to family law is exciting and extremely rewarding. Bronagh has found a new passion in this area of law. Her litigation experience enhances her ability to work efficiently with each client to reach the best outcome. If a fair settlement cannot be reached, she can effectively and diligently engage in motion practice and trial to pursue her client’s best interests. Outside the office, Bronagh enjoys skiing and kayaking at Lake Tahoe, traveling to new places, and getting home to Ireland to visit family as often as possible.